Several years later, an article in Modern Mechanix magazine in October of 1933 described Edison’s machine, in which a “tiny pencil of light, coming from a powerful lamp, bored through the darkness and struck the active surface,” which could detect the smallest particle. These particles would be proof of the afterlife, physical bits of human personality left in the atmosphere, waiting to be discovered. Unfortunately, after “tense hours” spent watching the delicate instruments, nothing happened; which was, the magazine adds, why no one had heard of this experiment before. 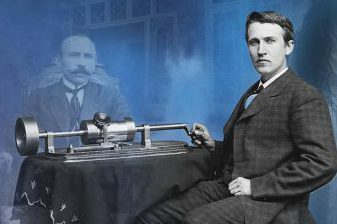 Read the entire article about Thomas Edison’s attempts to talk to the dead at Atlas Obscura! I wonder what other inventors of the current day might be quietly at work on similar projects. I could see Elon Musk bankrolling this.